Want to go fishing but don't quite know where to begin? This page is your one-stop shop for finding out what you need to know to begin fishing in California, or to expand your fishing horizons even if you have been an angler for years. Berkley, one of our sponsors, has helpful knot typing videos to show you how to tie every knot you'll need to know and how to choose the best line for each knot. Concerned about whether or not your catch is safe to eat? Use the safe fish eating guidelines from the Office of Environmental Health Hazard Assessment. For some cool fishing tutorials and tips, check out takemefishing.org, an official Passport Program Supporter. Information on their site includes how to catch certain species, tackle rigging tutorials, and how to identify good fishing locations. For more in-depth tutorials, check out the videos below produced by the CDFW Fishing Passport and Fishing in the City programs. 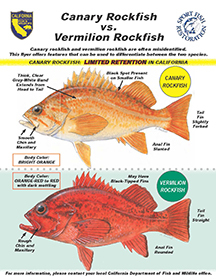 The CDFW Fishing Guide map will show you where fish are being stocked, what regulations apply to areas of interest, historically good fishing locations, and much more. Use the Mobile Fishing Guide for on-the-go fishing references. Living in the urban jungle doesn't mean you can't enjoy the outdoors through fishing! 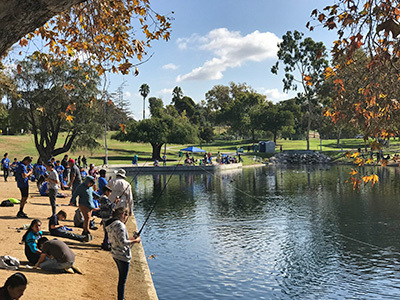 CDFW's Fishing in the City program teaches anglers young and old how to fish the urban lakes and waterways of the Sacramento, Los Angeles and San Francisco metropolitan areas. Check out their page for urban fishing programs and resources. Want to catch those deep sea or large open-water species but don't have your own boat? There are hundreds of commercial passenger fishing vessels (CPFVs, also know as "party boats") at almost every fishing harbor on the California coast.